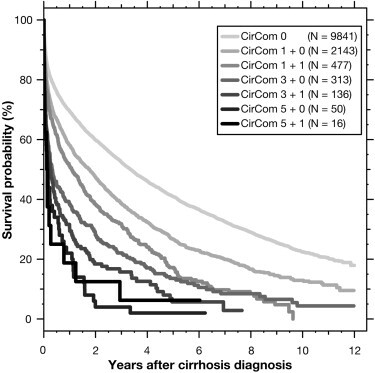 Scoring system to predict mortality among patients with cirrhosis based on 9 comorbidities. Points assigned based on co-morbidities. Jepsen P1, Vilstrup H2, Lash TL3. Development and validation of a comorbidity scoring system for patients with cirrhosis. Gastroenterology. 2014 Jan;146(1):147-56; quiz e15-6. PMID: 24055278.